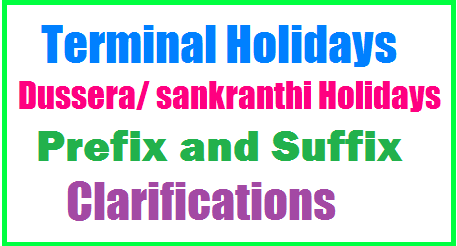 Terminal Holidays Dussera/Sankranthi Holidays Prefix and Suffix Clarifications. Terminal Holidays Dussera/Sankranthi Holidays Prefix and Suffix Clarifications. Clarifications on the Absence of re-Opening day or on closing day of the school during Dussehra Holidays/Terminal Holidays, Clarifications on Dussehra Holidays / Terminal Holidays Prefixing or Suffixing Absence on the Re-opening or on Closing day of the School. Clarifications on Summer holidays Prefix or Suffix, Absence on the Re-opening or on Closing day of the School. Suffixing or prefixing the summer vacation by sanctioning the other than casual leave to teachers,Andhra Pradesh Leave Rules 1933. Proceedings of the Director of Public Instruction, Andhra Pradesh::Hyderabad. The Principal P.R.Govt College, Kakinada, has sought clarification whether he can sanction leave to the members of staff prefixing the terminal holidays to the leave. He is informed that the "Terminal holidays cannot either be prefixed or suffixed to the leave"
As the Principals at certain Government Colleges are frequently addressing the director for clarification in this regard the following instructions are issued for the information of the Principals. 1. The vacation may be combined with or taken continuation of any kind of leave other than casual leave as per rule 12 of the Andhra Pradesh Leave rules. 2. But the holidays which do not exceed 15 days cannot be considered as vacation as per Rule82(2) of the Fundamental Rules. 3. Generally the terminal holidays in the vacation Department do not exceed 15 days and hence the period cannot be considered as vacation. 4. Further if the duration of the period of holidays notified in the Gazette can be prefixed or suffixed to the earned leave or half pay leave.The local holidays are not gazetted holidays. They are, therefore, requested to follow the above instructions scrupulously. # Summer Holidays Prefix and Suffix Clarifications.